As information technology develops, we have to upgrade our network products such as the cables, patch panels, etc. Besides, to reduce our data center’s cost, we are tempted to use the old and new ones to make a mixed connection. For instance, run Cat6a cables on Cat6 patch panel. However, does it work? Is it a reliable connection? Here we’ll discuss it in this article. Cat6a and Cat6 are both designed for Gigabit Ethernet. They can handle 10BASE-T, 100BASE-TX, 1000BASE-TX, and 10GBASE-T rate. Cat6 and Cat6a sound almost the same, but a single lowercase “a” sets the two terms apart. The word “a” stands for augmented, which makes them behave differently in performance, size and so on. Cat6 usually has 23 AWG wire conductors, and can support transmission speed of up to 10Gbps at 250MHz. But the theoretical top distance with 10Gbps speed is only 33-35 meters. While Cat6a also has 23 AWG wire conductors, but doubles the capability by delivering data at 500MHz. Moreover, it supports 10Gbps standard over the full 100 meter distance. Note that Cat6a is usually thicker than Cat6 cables, because Cat6a uses extra thick plastic. Therefore, Cat6a takes more space in a patch panel than Cat6. Can I Use Cat6a Cables on Cat6 Patch Panel? Ethernet patch panel is the easiest method currently for your networking needs by providing a reliable and neat Cat6 and Cat6a cabling. Usually, we use Cat6 patch panel to connect Cat6 cables, and Cat6a patch panel is for Cat6a cables. However, there isn’t much practical difference between Cat6 and Cat6a patch panel. Then how about installing Cat6a on cat6 patch panel, will it work? There are several things to consider before answering it. Cat6a is the updated version of Cat6, they share the same RJ45 connectors. Therefore, it’s no doubt that Cat6a cables can be plugged into the Cat6 patch panel. Cat6a cable’s size is bigger, so the corresponding minimum bend radius is larger, which will change installation requirements for routing and handling as well as design of pathways and spaces. For example, when we install Cat6a on a 48 port Cat6 patch panel, the larger wire may end up bending. So it’s not entirely safe to wire Cat6a on the 48 port patch panel, you have to manage it with much more patience and caution. Commonly, conductors determine whether the connection works or not. Thus, in this respect, Cat6 patch panel will work with Cat6a cables, since they have the same RJ45 conductors. But from the above we know it’s not safe enough to do so. To sum up, Cat6a cables are able to run on Cat6 patch panel. However, there are some disadvantages exist in this job. So I’d like to suggest that if you just want to make an experiment at home, it’s surely OK. But if you want to use Cat6 patch panel with Cat6a in your data center, that’s not inappropriate. Because the cables may be out of work, which will cause damages to your business. If you would like to know more about designing or choosing the right cabling infrastructure, please contact us via sales@fs.com. Related Article: Does Cat6 on Cat5e Patch Panel or Cat5e on Cat6 Patch Panel Work? How to Connect Patch Panel to Switch? Some people say that patch panel is a waste, and only a network switch matters. Others, however, hold firmly that patch panel is a significant gadget without which you can hardly imagine how the network cabling will look like. As far as I am concerned, we should view it accordingly. 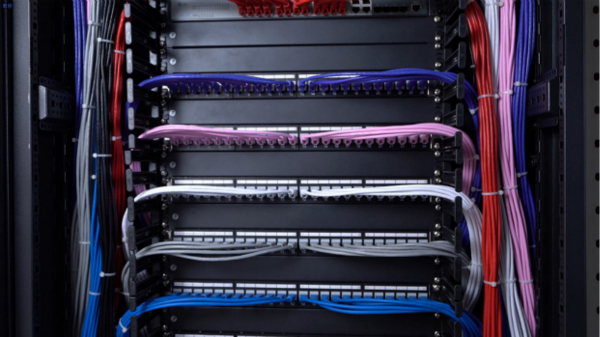 Why We Should Use Patch Panel? Apart from the easier cable management it provides, its function resembles the railroad switch. And let’s compare the cables to rails to see how it works. With a railroad switch(patch panel), the train(data) can travel from A to B, C and even more destinations, otherwise it can only go from A to B, or C to D. This article, What Is a Patch Panel Used for?, has explained it thoroughly. In addition, FS.COM offers extensive selection of patch panels. Having made clear of the function of patch panel and the switch, let’s see together how do they connect in the network cabling in case of mistakes in the layout process. Assume that we have a two 24 port feed through patch panels and two 24 port switch, and all the devices mentioned below. We don’t take the punch down panel here is because it has to be punched down first then to connect the cabling system. 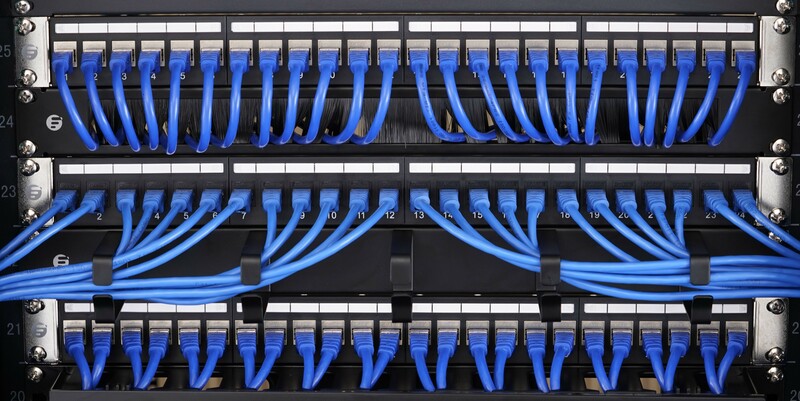 If you use a punch down patch panel, the methods and procedures to punch down it have been listed in my previous article—How to Punch Down Cat6 into Patch Panel. Find a cabinet large enough to accommodate both the patch panel and switch. And mount the 24 port patch panels and switches all in the same rack. 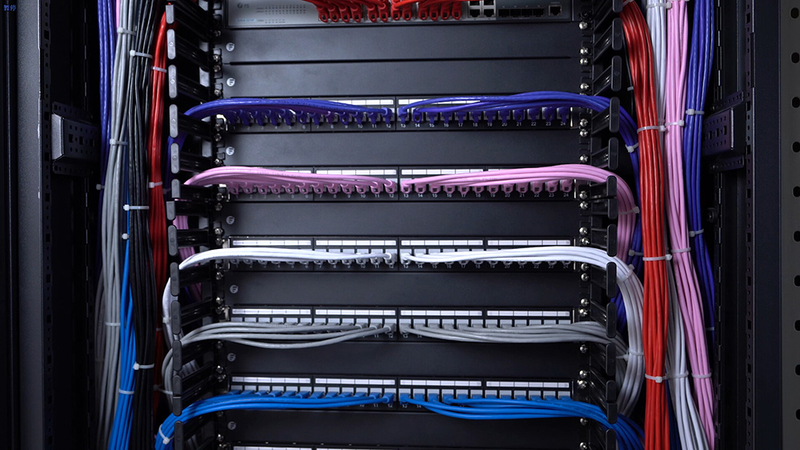 The order from the top to the bottom is like this, patch panel 1, spacer, switch 1, patch panel 2, spacer and switch 2.And prepare the cables in a proper length. Prepare the cable in a proper length to avoid the mess. Use the top 12 ports on the patch panel for the bottom 12 ports on the switch, and the bottom 12 on the patch panel for the top 12 ports on the switch. The one set of patch cables would be just a bit shorter than the other 12. Connect the modulars on the rear side of the patch panel with the cables that go to each unit or room. OK, congratulation. Now you have a very neat and beautiful cabling system. When powering on, the whole system will work orderly in their own places. All in all, a patch panel is more of an extension of your Ethernet cables. It’s used for the purpose of neatness and the achievement of data crossover. A switch connects your devices into a network allowing them to communicate and share files with each other. To help you better understand the ways to connect the two, we are planning to produce a video to illustrate the steps in details. You can refer to FS.COM for more information and follow us for the further knowledge. The rapid development of telecom technology is driving the increasing need for higher bandwidth in data center. In recent years, 10GBASE-T technology, which uses twisted-pair copper cabling and RJ45 interfaces, has been utilized by many data center managers. When it comes to 10GBASE-T, we firstly think of Ethernet network cable, such as Cat6 UTP cable and Cat6a cable which support 10G speed over 55 meters and 100 meters respectively. They are cheap and easy to run in data center. And this is just one of the most prominent characteristics of 10GBASE-T technology. This article is going to give a detailed introduction to characteristics of 10GBASE-T. In data center, fiber optics also generally gain popularity because of their high speed and low latency. Many data center managers choose to use a combination of Direct Attach Copper (DAC) cables for short distances (up to 7 meters for Top-of-Rack connections) and fiber optic cabling for longer distances (for End-of-Row connections) to fulfill the migration to 10GbE networks. However, the costs associated with a Top-of-Rack switch and expensive cabling and optics limited the widespread adoption, especially in data centers where 1GbE is already broadly deployed. On the contrary, 10GBASE-T is backward compatible with 1000BASE-T, and it can be deployed in existing infrastructures that are cabled with Cat6 and Cat6a or greater cabling, helping data center managers to keep costs down while offering an easy migration path to 10GbE. Therefore, 10GBASE-T technology is extensively used. 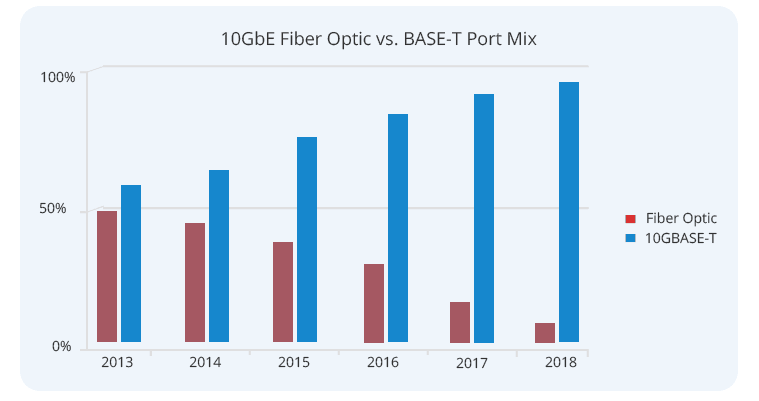 From the chart below, we can clearly see the growing trend of 10GBASE-T.
Reach: DAC cables support 10Gbps over very short distances, while 10GBASE-T technology can reach much longer reach with Cat6a cable, up to 100 meters. This makes 10GBASE-T cabling with Cat6a the best universal solution for 10GbE requirements in today’s data centers. Backward compatibility: 10GBASE-T is backward compatible with 1000BASE-T, so it can work with existing structured cabling system. Unlike SFP+ cabling, a 10GBASE-T connection can auto-negotiate and auto-select the proper port speed when plugged into a GbE port. This gives data center managers much flexibility in cabling system. Installation: Fiber optic cable is easily damaged, while Cat6 cable and Cat6a cable are easy to manage. Even if you want to DIY your own cable length, you just need bulk Ethernet cable, crimping tools and RJ45 connectors. As RJ45 connectors are compatible with existing 1GbE infrastructure, the installation of Cat6 and Cat6a cable is easy. Power: When 10GBASE-T standard was released at the beginning, 10GBASE-T PHYs consumed too much power which limited its widespread adoption. With process improvements, both the power and cost of the latest generation of 10GBASE-T PHYs have reduced. Cost: Fiber optic cable is more expensive than Ethernet network cable, and usually fiber optic cable is used for long transmission distance application. While Cat6 cable and Cat6a cable are low cost, which can provide cost-effective and easy-to-use solution for 10GBASE-T short distance network deployment. 10GbE has been the mainstream of telecom data center right now. The low cost and easy installation of 10GBASE-T makes it widely applied. In addition, 10GBASE-T provides investment protection via backward compatibility with 1GbE networks. On the market, there are not only Cat6 cable and Cat6a cable for 10GBASE-T cabling, but also some other 10GBASE-T products, such as 10GBASE-T switch and 10GBASE-T adapter. These simplifies data center networking deployments by providing an easier path to 10GbE infrastructure. These characteristics of 10GBASE-T will help drive 10GBASE-T to a prominent place in the data center. FS.COM is a reliable manufacturer which provides high quality Cat6 cable and Cat6a cable at customized length. Also, there are 10GBAST-T RJ45 transceivers. For more details, please visit www.fs.com. Network technology is developing rapidly. To keep up with the trend, data centers are required to upgrade constantly, from 10G to 40G, 40G to 100G and even 100G to 400G. However, for some small business data centers with 1G infrastructures, directly migrating from 1G to 10G is a little fast. Is there any slower Ethernet standards to fill the gap between 1G Ethernet and 10G Ethernet speeds? The answer is Yes—2.5 Ethernet and 5G Ethernet. This article will talk about 2.5G and 5G. 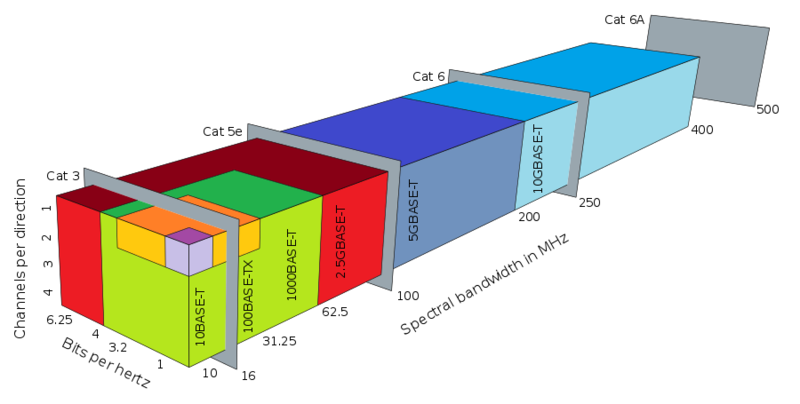 The physical (PHY) layer transmission technology of IEEE 802.3bz is based on 10GBASE-T, but operates at a lower signaling rate. By reducing the original signal rate to 1/4 or 1/2, the transfer rate drops to 2.5 or 5 Gbit/s, respectively. The spectral bandwidth of the signal is reduced accordingly, lowering the requirements on the cabling, so that 2.5GBASE-T and 5GBASE-T can be deployed at a cable length of 100 meters on unshielded Cat5e cable and Cat6 cable, respectively. The following figure shows the comparison of twisted pair based Ethernet technologies. As 2.5G and 5G Ethernet standards came out after 10G Ethernet standard, there are mixed reviews for them. This part will focus on cons and pros of 2.5G/5G Ethernet standards. 5GBase-T and 5GBase-T are more going to be used for wifi rollouts. And they are pretty much strictly for enterprise wireless deployments. 10GbE is getting pretty cheap. Lots of new desktop motherboards now have 10G NICs inside them and the premium seems to be less than $100 too, which isn’t too bad. What’s missing is a bunch of 10G home switches and routers. As for the availability, the 10G has 2 models out while the 2.5G and 5G are both “coming soon”. Due to the economies of scale and the penetration, 10G already has IMO. While 2.5G and 5G will never be widely adopted or supported. There are not that many chip sets that support 2.5G Ethernet and 5G Ethernet yet as they really only got finalized. Also, most cards that support them right now also support 10Gbe. What exists is reasonable. One estimate is that there are 70 billion meters of Cat5e and Cat6 cabling have been sold between 2003 and 2014. With such a significant amount of existing infrastructure at stake, it’s hardly surprising that most enterprises want to extend the existing cabling, component and equipment investments in the standard Ethernet wireless closet. Therefore, it is not difficult to find that 2.5G Ethernet and 5G Ethernet standards have their advantages. Cat5 and Cat6 cabling can’t support 10G Ethernet up to 100 meters, but they will be able to support the emerging 2.5Gbps and 5Gbps standards, thereby preserving the value of the existing copper cable plant. Adopting new 2.5G and 5G can satisfy the need of increasing data rates of wireless networking. 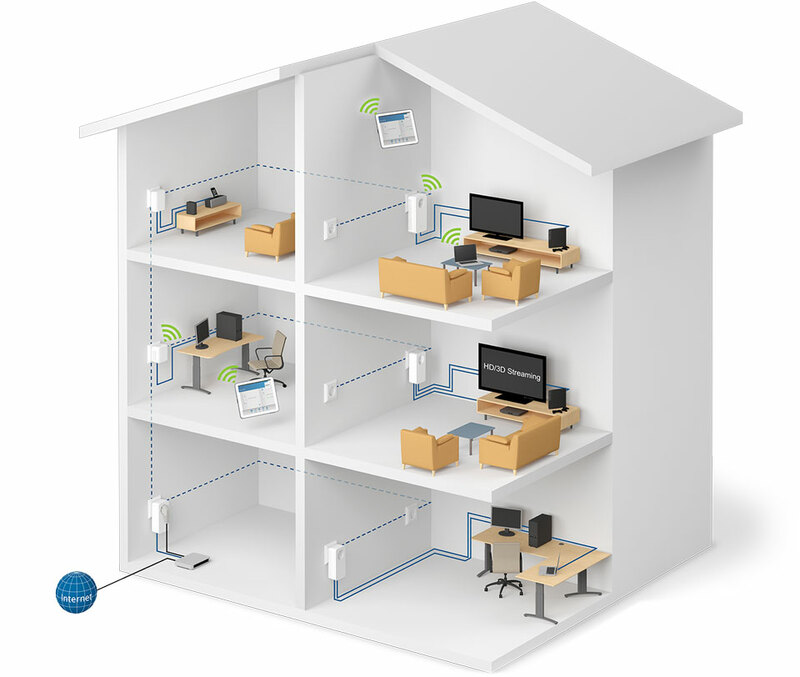 The new 802.11ac Wi-Fi standard increases wireless bandwidth, supporting Ethernet speeds of 1.7 Gbps to 2.5 Gbps. With the coming of the next generation of wireless networking, 802.11ac Wi-Fi Wave 2, wireless network speeds could increase to as high as 6.8 Gbps. Besides the need from the Wi-Fi industry, a 2.5G/5G version will also aid in other applications such as enterprise infrastructure, cellular Wi-Fi offloads, small cells, security cameras, multiple industrial uses and PoE technology. These two new Ethernet standards have plenty of attributes to ensure success, such as ease of use, backward compatibility, faster speeds without requiring a cable upgrade, incremental speed upgrades, multi-vendor interoperability, not to mention optimized cost and performance. From the above content, we can conclude that 2.5G/5G Ethernet standards have both pros and cons. For those who want to upgrade cabling system to 10G, 2.5G/5G is not useful. While for small business and home network, 2.5G/5G is a cost-effective solution. No matter what your cable plant is, choosing a suitable migration path is the most important thing. FS.COM can provides high quality components for your cable plant, such as Cat5e cable, Cat6 cable, wireless access point and PoE switch. For more details, you can visit our site. In fact, once you have decided to deploy network in your new house, there will be a lot of things that you have to think about, such as which type conduit to run, how long cable to buy, where to place the router, how many access points to set up, which kind PoE switch to buy, and so on. But there is another important thing that you must pay attention to, that’s where to buy what you need. 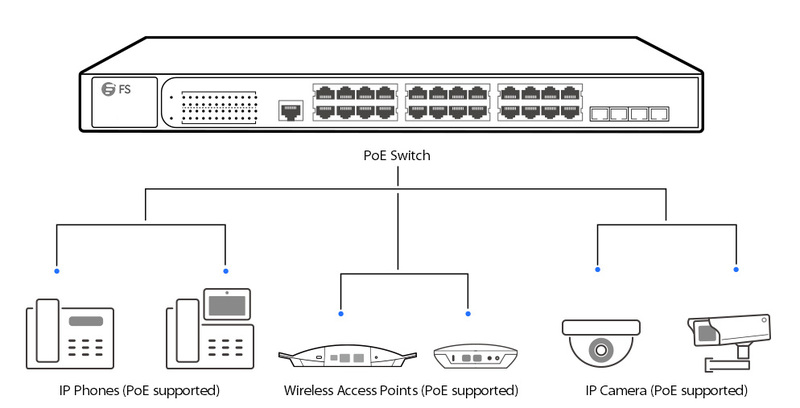 FS.COM can provide you high quality products at low price, such as 305 meters (1000 ft) is US$ 120.00, 8 port PoE switch is US$ 159.00. For more details, you can visit our site.